TinModel announces a new modeling capability: PVD processes with arbitrary motions of substrate and/or source. You are no longer bound by common tooling methods (single rotation or dual rotation, etc.). TinModel's PVD simulation software can now model coating processes in which the source and substrate can move in any arbitrary fashion. This capability is realized through integrating a string of "simple" processes that are specified within a V-Grade 5S program. We mean, ANY ARBITRARY PROCESSES! If you can imagine it, TinModel software will model it for you! For example, you may wonder what if I rock the angle of the target in an ion-beam sputter-deposition system. All you need to do is specifying a string of elemental processes, each of which corresponds to a fixed but different angular position of the target; you may also enter the weight for each elemental process to simulate the real motion because a rocking motion does not have fixed velocity. The String Processor of V-Grade 5S will take care of the rest. 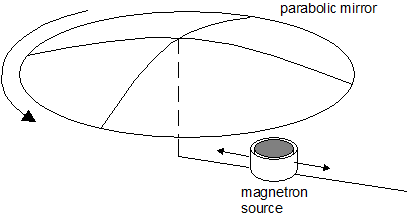 ​Shown above is another example: coating of a large parabolic mirror with a small planar magnetron source, which is made to move in a radial direction. Assume that the mirror is 1 meter in diameter and the source has a circular race track of 12 cm in diameter. In V-Grade 5S we specify and save 13 elemental processes: the source is placed at 13 different radial positions (5 cm apart from 0 to 60 cm) while the mirror undergoes a simple rotation. These 13 elemental processes can then be imported into the String Processor of V-Grade 5S for computing. It is obvious that the source needs to reside at the 13 positions for a varied amount of time in order for the coating to be uniform. The residence times can be simulated by the weights associated with each of the elemental processes. 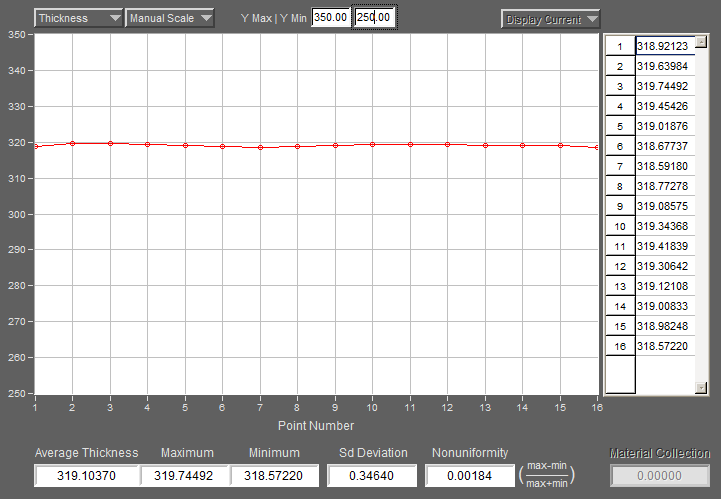 Through manual adjustments of the weights one quickly arrives at a residence-time profile shown below. The above residence-time profile yields a very uniform thickness distribution on the parabolic mirror. 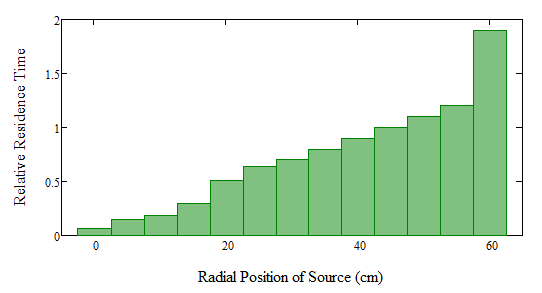 The plot below shows the thickness distribution across the entire 50-cm radius of the mirror surface. The non-uniformity is within +/-0.2%. With the String Processor, the variety of coating processes one can model is limitless, no matter how unusual and complicated they may be, including (but not limited to) varying-speed motions of substrates, three-fold rotations of substrates, arbitrary source movement and dynamic magnetrons. We invite you to contact Tin Model for details. We also accept PVD modeling challenges from you!